You are here: Home » EFL Spring 2008 online! 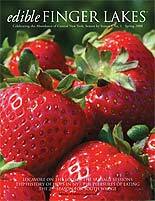 The debut issue of Edible Finger Lakes (with my article on CSAs) is now online. Click here to read the full issue. The summer issue is scheduled to hit newsstands on July 15 and features with many tasty articles (including one I wrote) — be on the look out!